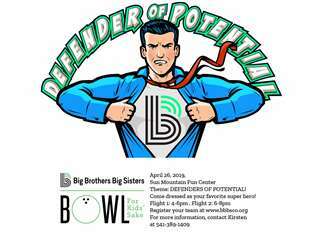 It’s Time for Big Brothers Big Sisters of Central Oregon’s 20th Anniversary Bowl For Kids’ Sake. Gather your team and get ready for the most fun you'll have in rented shoes! This event is open to companies, families, and friends who want to have fun and support the mission of Big Brothers Big Sisters. Get a team of 6 people together and reserve your lane today! By bowling with us or making a donation to a bowler (or both!) you help us carry out our mission—to provide children facing adversity with strong and enduring, professionally supported one-to-one relationships that change their lives for the better, forever. Creating your team is easier than ever with our new fundraising platform, which allows each participant to create their unique fundraising page through Facebook or email, displays individual and team fundraising goals, and shows which individuals and teams are in the running for the most money raised, and who will win the grand prizes! Grand prize for the individual and team who raise the most money!